In other words, don’t adapt your trading style to the functionalities of your platform, but choose your platform according to the necessities of your trading style . Think about this for a moment, and let it give pause: what do you really need to enhance both your trading experience and your trading performance ? Are you a new trader who is just getting started ? 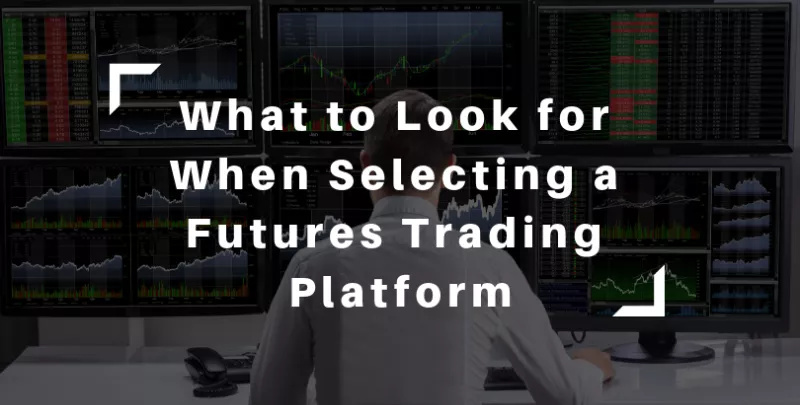 If so, you may need to cycle through many futures trading platforms as you discover, develop, and refine your trading approach. Are you a seasoned trade r whose approach might be more or less set? If so, you may need a new platform to upgrade a specific aspect of your trading performance or to modify your approach or overall strategy by way of a new or different technology. Some platforms allow you to code and construct your own indicators . But let’s talk about order routing speed. Some traders will pay more for a “faster” trading platform. What many traders don’t realize is that sometimes the difference in speed can only be noticed when placing high-volume orders. This means that beyond a certain volume threshold, say (hypothetically) 100 futures contracts in one trade, you may notice less slippage with a “faster” platform. But below this threshold–and many day traders typically don’t trade anywhere near even 20 contracts per trade–the difference in speed may be negligible. Instead, traders may end up paying more in costs for low-latency functionalities that they never get to experience. Think twice about your platform if speedy order routing is one of your main criteria for platform selection. Access to Markets and Asset Classes: This is a no-brainer. You need access to the exchanges that offer the markets and asset classes you trade. In the U.S., it isn’t common for a single FCM to offer access to multiple international products or exchanges. Not all FCMs even offer access to options on futures. Let’s suppose that you trade products on the CME, SGX, and Eurex. If you can find a single platform that can offer access to multiple products, exchanges, and (if you’re lucky) multiple FCMs, then you may have a winner. Finding a single platform that provides access to every product you trade may be a lot more efficient than using two or more different platforms. Backtesting and Forward Testing Simulations: If you are the type of trader who actively develops and tests different trading strategies, then it would help to have both backtesting and forward testing capabilities to test your trade theories in a simulated market environment before going live. What’s critical here is having enough historical data to have a large enough sample size to make your simulated runs more representative of real-world trading. Bear in mind that results from a one-year simulation may not match the results of a simulation run for a period of a decade or more. Sample size is everything when it comes to simulated testing, The larger, the better. Where Are Your Orders Being Held? When it comes to basic stop, limit, and market orders, where are you orders actually being held–on your computer, your FCM’s servers, or on the exchange? This is an important consideration because, eventually, all electronic systems will experience some degree of failure. So if your computer crashes, your internet connection fails, or your FCM’s server goes down, knowing exactly where your open orders are being held can help you decide who to call to either monitor your positions or manage your open orders. Desktop VS Mobile/Web-based Access: If you are often on the road, then trading strictly via desktop computer may not be the best solution for you. You may require access to trading via mobile phone or tablet. If your futures trading platform doesn’t have a mobile app version, consider platforms that have a “web-based” version that can be accessed using any device with an internet connection. Again, if you are constantly traveling, then you may need a trading solution that can follow you wherever you may go. News Feed: For some reason, news feeds on trading platforms are more common among stock trading platforms than futures trading platforms. But if you trade the news, then access to a news feed may be a mandatory item. It might be even better if your platform can alert you to scheduled events and economic reports. There are a few around, and Optimus Futures offers a futures trading platform designed specially for the news-based trader.